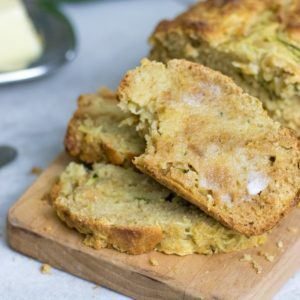 A tender whole grain loaf of naturally sweetened zucchini bread made with crushed pineapple. Preheat oven to 350 degrees. Grease 2 8x4 loaf pans. In a large mixing bowl, combine the flour, baking soda, baking powder, salt and cinnamon. In another bowl, mix together eggs, honey, oil, applesauce, and vanilla. Pour the wet ingredients into the dry ingredients until just combined. Fold in the zucchini and pineapple. Divide batter between the loaf pans and bake for 45-50 minutes or until a toothpick comes out clean. Sometimes, this may take up to 60 minutes depending on your oven. Cool in pans for 15 minutes and then remove from pan to cool completely. Melted Coconut Oil can be substituted as well for canola oil.